At the last KOA we got a bumper sticker and cut off the name of the particular KOA (West Palm Beach). Since we spent most of the trip staying at KOAs it seemed appropriate to add the KOA logo sticker to the back window of the car. 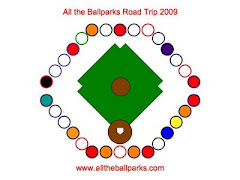 The final team logo sticker to represent us visiting all 30 MLB ballparks this summer was the Florida Marlins. The sticker for the Marlins is the Marlin fish logo. Dad put it up after we got it at the Team Shop and before the game. After the game Dad and I took photos of each of us in front of it, but Mik would not pose. I did finally get one with him five days later and will be posting that after a few other posts.